Perfect for all skin types and mild enough to use on babies and children, the First Aid Beauty Ultra Repair Wash works to effectively cleanse and nourish the skin with a blend of moisturizing ingredients and skin friendly humectants. Helping to preserve the skin's natural oil, the rich and creamy body wash will rid your skin of toxins and grime while improving moisture retention and soothing irritation. - K.N. *Free from parabens, harsh chemicals and colorants. Safe for sensitive skin. 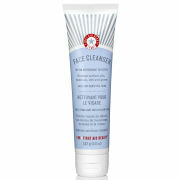 Using a soft cloth, sponge or hands, apply a generous amount of the cleanser and gently massage into the skin. Water, Glycerin, Sodium Cocoamphoacetate, Lauryl Glucoside, Sodium Cocoyl Glutamate, Sodium Lauryl Glucose Carboxylate, Glycol Stearate, Coco Glucoside, Glyceryl Oleate, Citric Acid, Stearamide AMP, Phenoxyethanol, Caprylyl Glycol, Acrylates/C10-30 Alkyl Acrylate Crosspolymer, Sodium Phytate, Sodium Hydroxide, Chrysanthenmun Parthenium (Feverfew) Extract, Glycyrrhiza Glabra (Licorice) Root Extract, Camellia Sinensis Leaf (White Tea) Leaf Extract.